The Anchor Inn is a beautiful country pub next to the River Ouse near Lewes. The inn was built on the west bank of the river in Barcombe in 1790 and the area remains one of the most unspoilt areas of East Sussex. Now a thriving pub, restaurant and wedding venue, The Anchor Inn offers traditional charm and cosy nooks to enjoy their real ales, fine wines and freshly prepared food. A charming wedding venue with marquee. A spacious marquee can be hired for weddings and events for up to 160 guests, complete with a sunny outdoor terrace overlooking the river. Boating is available on request for your wedding party. The sides of the marquee can be lifted to enjoy the spectacle or to simply take in the views across the river and open countryside. 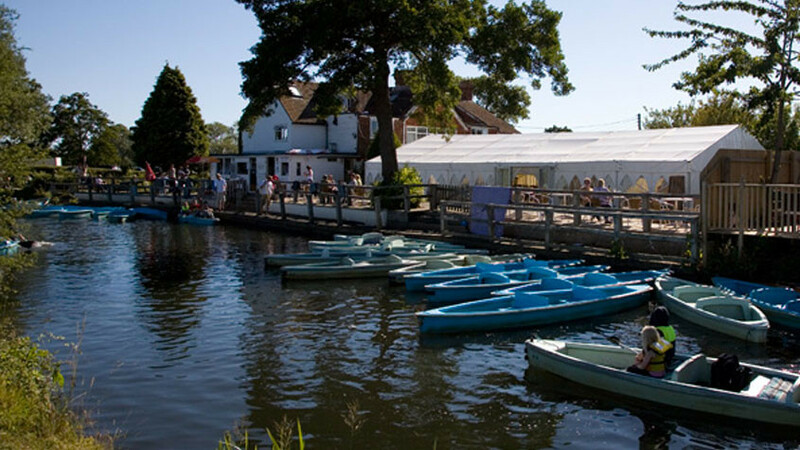 The wedding marquee is a permanent fixture at The Anchor during the summer months and makes an ideal venue for up to 160 guests. The marquee is beautifully lined and comes with flooring and a dance floor. Furniture, furnishings and decorations can be adapted to your wedding theme. The inn offers varied catering options from buffets to three-course meals and is licensed to hold civil wedding ceremonies seating up to thirty-five guests. Set in the countryside and available with late licence. Located just 4 miles upstream from Lewes and easily accessible from Brighton, this charming riverside wedding venue offers parking and accommodation and can also arrange a late licence for your wedding party. Find out more here or contact The Anchor Inn on 01273 400414 to arrange a viewing.